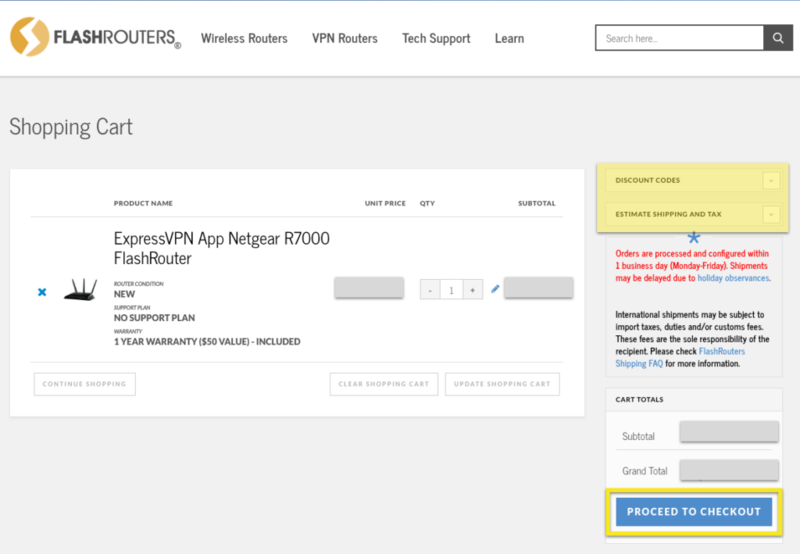 This tutorial will show you how to purchase, connect, and configure an ExpressVPN DD-WRT FlashRouter. Note: You can purchase a plug-and-play DD-WRT FlashRouter, which is preconfigured with one of ExpressVPN’s servers. Or you can purchase an unconfigured DD-WRT FlashRouter and configure it yourself. Go to the ExpressVPN section of FlashRouters.com. 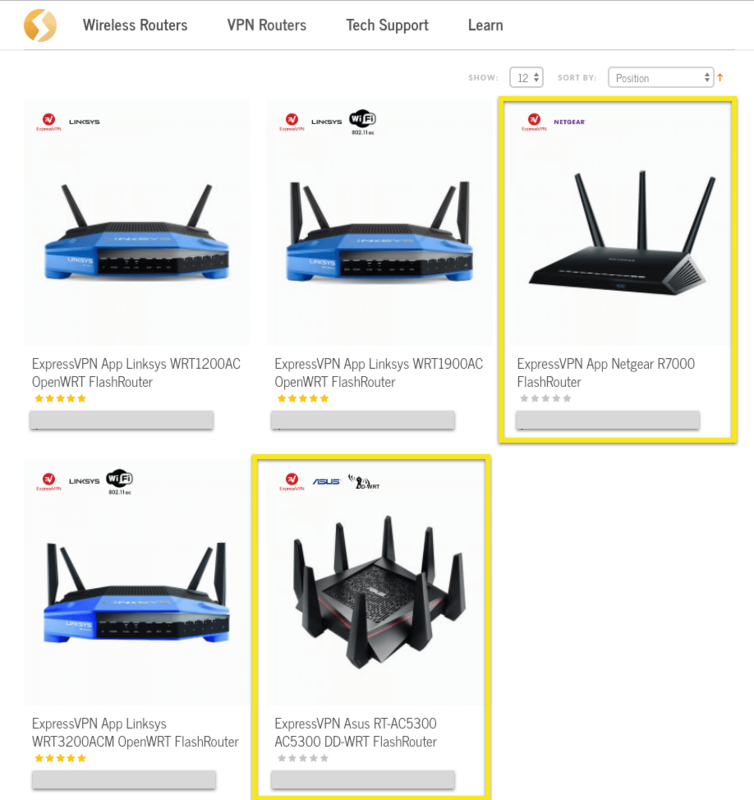 Select a DD-WRT FlashRouter. Two of the DD-WRT models are highlighted in yellow below. On the router product page, select a Router Condition, Support Plan, and Warranty. All FlashRouters come with a 1-year warranty. You may select No Support Plan to save money on your purchase. You will still be able to use ExpressVPN’s Support services. Click ADD TO CART, then click GO TO CART PAGE. Take a moment to review your order. If you have a coupon code, enter it in the DISCOUNT CODES field. If you want to calculate an estimate of your shipping and tax, follow the steps under ESTIMATE SHIPPING AND TAX. Once you’re ready, click PROCEED TO CHECKOUT. Enter your Billing Information, Shipment Method, and any Order Comments you may have. If you forgot to enter a discount code on the previous page, you can enter it here. Click PLACE ORDER to complete the transaction. If you would like to have your VPN router preconfigured to any additional settings, enter your preferences in the ORDER COMMENTS box. 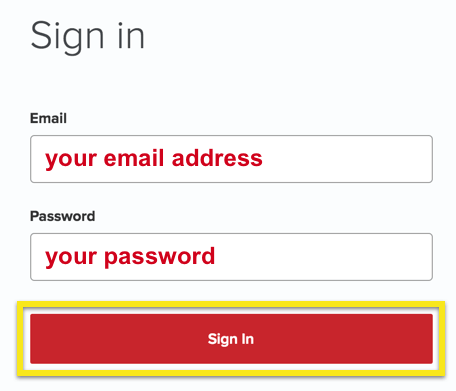 You can also set the VPN username and password by filling in the accompanying fields. If you would like your router to arrive already signed into your account, you must enter your ExpressVPN account ACTIVATION CODE below the comments box. 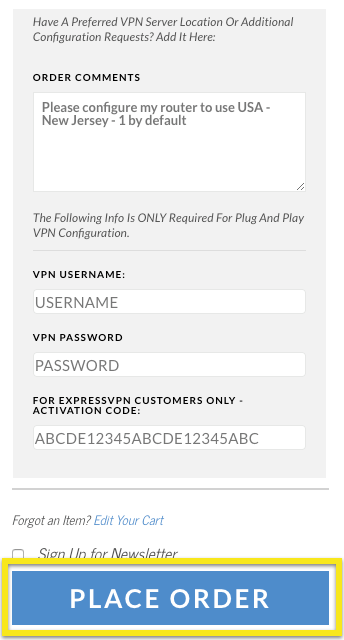 You can find your activation code after signing in to your ExpressVPN account. When you have finished filling everything out, click PLACE ORDER. Note: If you do not want your FlashRouter to come pre-configured with an ExpressVPN server on it, you can skip filling out the Order Comment. Detailed instructions for setting up a VPN server will be included in the box, or you can refer to the section below to learn how to configure your ExpressVPN FlashRouter with a VPN server. Once you receive your FlashRouter, connect it to your existing router with an Ethernet cable and switch it on. This will create a dual-router setup and will avoid any potential conflicts with your existing internet setup. Now you can connect your computers, mobile devices, smart TVs, and more to the ExpressVPN FlashRouter and enjoy the benefits of ExpressVPN. Connect your device with an Ethernet cable. Your FlashRouter came with a piece of paper with all of your FlashRouter Settings, including your wireless SSID and password. Use these credentials to connect any device to your FlashRouter. This section will show you how to configure your FlashRouter with one of our VPN servers. your FlashRouter did not come preconfigured with one of our VPN servers. you want to configure your FlashRouter with another VPN server. 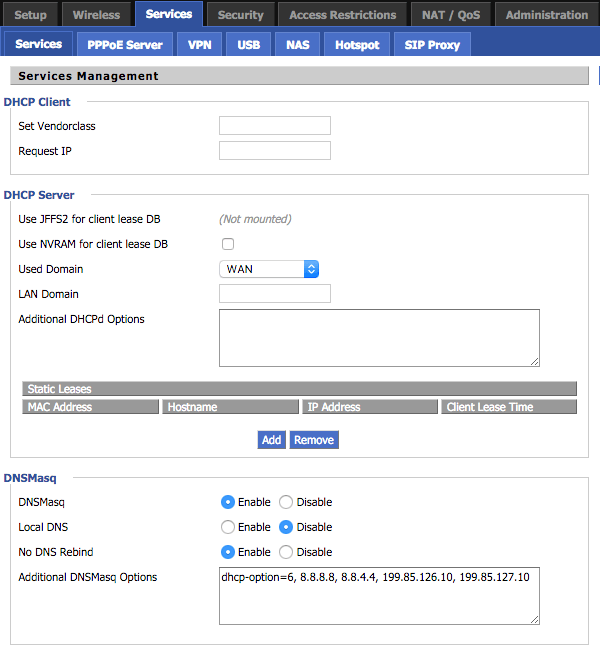 You will need to download our .ovpn files to configure your router with a new VPN server. In your browser, go to your router’s control panel by typing your Router IP Address in the address bar. The default address is 192.168.11.1. 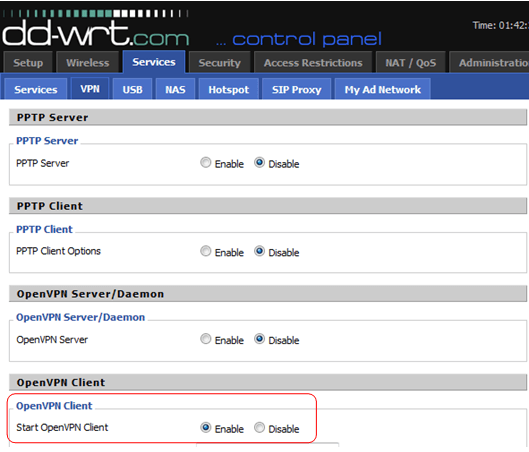 In your router’s control panel, click on the Services tab, then click on the VPN tab. 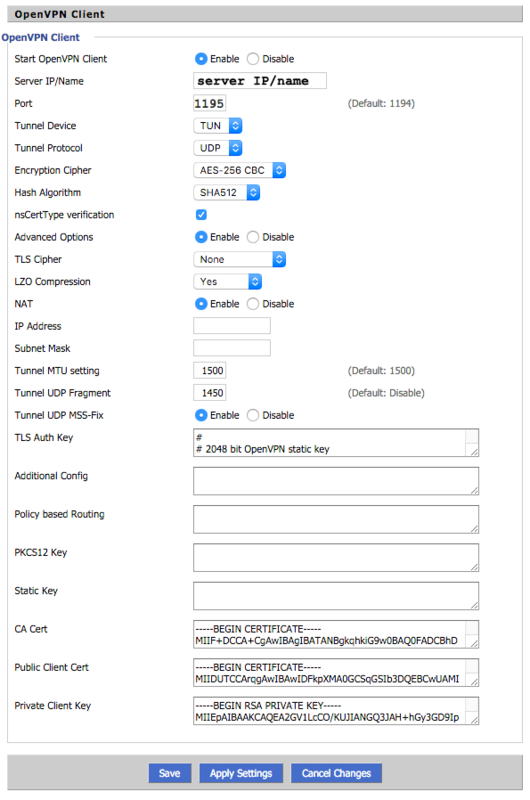 Enable the Start OpenVPN Client option. 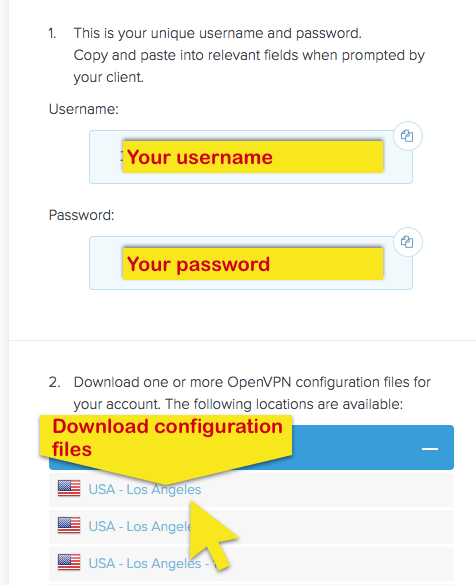 This will reveal the OpenVPN configuration panel where you will enter your settings. Enter the settings as shown in the screenshot below, then click Save > Apply Settings. Scroll down to learn how to find your Server IP/Name and Port. You can find your Server IP/Name and Port in the .ovpn config file you downloaded earlier. Open the .ovpn config file using any text editor. Copy any of the “remote” server cluster names listed in the config file, and paste it into the Server Address/Port field of the OpenVPN basic control panel. Do the same for the port. 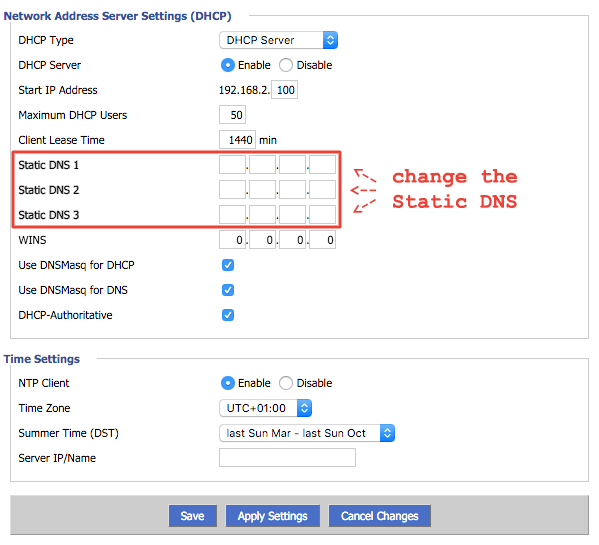 Click Save > Apply Settings to connect your router to the new VPN server. For any further details about using your DD-WRT router, please refer to the guide provided with your FlashRouter. This will tell all devices connected to the router to use the specified list of DNS servers to ensure that all DNS goes through the VPN tunnel.